The BT Radioshuttle is an electrically powered load carrier that transports goods in and out of storage tunnels within specially designed racking. This high-performance solution for the efficient handling of goods allows extremely cost-effective use of expensive warehouse space, making it ideal for temperature-controlled stores. Unused space, such as that above galleries or mezzanines, can also be fully utilised with BT Radioshuttle. The BT Radioshuttle can be handled by any standard reach truck or counterbalanced truck and has a load capacity of 1.5 tonnes. Several pallet sizes are available. The BT Radioshuttle is an automated load carrier that can be handled by any standard counterbalanced truck or reach truck. Remote controlled with a high travel speed, the BT Radioshuttle is a radical solution for efficient handling of goods in high-density racking. The semi-automatic functionality of this load carrier helps to save time by reducing the need for operators, who can be used for more demanding material handling tasks. 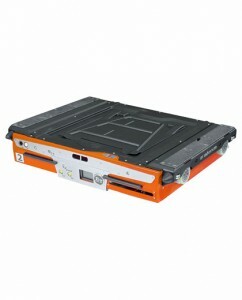 The RS150 has a range of units for different pallet sizes up to 1200×1200 mm² and several units can be controlled from anywhere by one transmitter, making this electronic load carrier easy-to-use and cost-efficient.